The TAPV was procured to provide a battlefield mobility solution for the Army. Vehicles of its ilk have been used by others very successfully in low intensity conflicts around the world for decades. Heck, the Brits figured out fairly quickly in NI the importance of having a vehicle that could get troops from Point A to Point B safely. The French, South Africans, Portuguese, British, etc. Have all figured out what an Armoured Patrol Vehicle is good for, why is the Canadian Army having trouble wrapping their head around the problem? The problem is/appears to be (optics wise anyway) that Canadian staffers (or their overseers) like to over think problems, [perhaps to] perpetuate them and then come up with unrealistic expectations of what we want or need at the pointy end...add to that our procurement process is like watching molasses crawl up hill in the dead of winter. For some reason, everyone wants to take a relatively simple thing and make it complicated. Army example - the C16...Medical example - the UNMO medical kit (pet project of mine that some knobber turned from something simple and small into something enormous and completely out to lunch MR). It doesn't seem that the mobility issue was the one that's causing the discussion problem (though they don't carry a lot of troops extra), it's the recce usage of these vehicles which most (and rightly so) are taking umbrage with. They are going to be good for low-intensity conflicts (if Mali ever happens). But for armoured recce well the jury is defn' out. Seeing a lot of TAPV rolling around flooded neighborhoods in Quebec on the news. Nice to see the high ground clearance is good for something! Any feedback from troops using them there yet? Had a chat with a few 12 RBC types out there on OP Lentus. Their take on it was cautiously pleased. Essentially they haven't had enough time to play with them to make a full assessment but they really liked the mobility and handling and that they could get in and out of tight spots. Time will tell I guess. It's also incredibly quiet. We have a habit of taking things that are crap simple and making mountains out of mole hills. The C16 is a prime example, great direct fire weapon yet we procure this super complicated computer system to solve a problem that doesn't exist if we had just bought an automatic grenade launcher and also bought a new mortar system (literally one of the cheapest most utilitarian weapons systems on the battlefield). Probably would have cost less money. Actually it is a mobility issue that's causing problems. 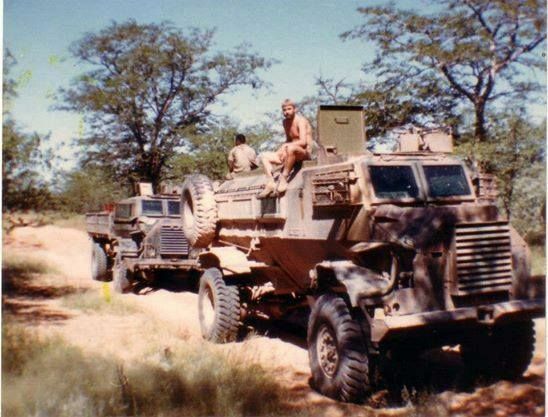 We needed a vehicle that could get people from point A to point B over mined/booby-trapped roads and through ambushes, which is exactly what these vehicles are designed to do, Namibians and Rhodesians used to use these types of vehicles not only as machines of war but also as school buses for their kids because the rebels would mine/boobytrap the MSRs, just like the Taliban would use IEDs. One of the reasons I always laugh at us talking about use of IEDs in Afghanistan as if this was some revolutionary new way of warfare? Nope it's been going on since the Algerian War, but we just paid no attention because the Canadian Army had basically ZERO experience in counter insurgency operations before Afghanistan. What we are seeing in the Canadian Army is an institutional clash of cultures, the institution is fixated on conventional warfare in Europe because that is what it had known up until our brief foray in to counter insurgency warfare circa 2006-2011. The infantry didn't want the TAPV because it wasn't an IFV, they see no use for anything that can't accompany tanks across the LD. Likewise, rather than trying to work with the TAPV, the Armoured Corps see's it as a lemon because it isn't a recce vehicle or a tank. Adjusting to the TAPV would mean adjusting the section to fit 36 people into 6 vehicles. How are you going to squeeze 10 bodies into 6 seats? And what are you going to do with the 2 spare vehicles? Now, if you asked me (and nobody is so I will volunteer myself), if you asked me, I might be considering something like 3 sections of 2 vehicles with one section being the Cmd and Spt section. The 2 sections have a vehicle team of 4 (2 drivers, 2 gnr/cc) and 2 fireteams of 4. The C&S section has the PL and the P2 with their drivers and 8 spare seats for the odds and sods. But that wouldn't conform to doctrine. Would it? The vehicle doesn't conform to doctrine anyways. My personal opinion is we bought a lemon because we didn't conceptualize what we wanted before we bought it. We could rip the inside apart to make it conform to what we actually want now that we've bought it, already did it with the LAV III so why should this vehicle be any different. Rhodesia Army based their sections around bricks of four because that's what they could fit in an Alouette helicopter. Platoons were usually 8 bricks of 4. 4 bricks would fly by helicopter, other 4 would follow by ground. 4 bricks would fly by helicopter, other 4 would follow by ground. So for us, does that equate to 4 bricks in rental vehicles, and 4 bricks on foot? So for us, does that equate to 4 bricks in rental vehicles, and 4 bricks on foot without boots? That's the one the belgian army is going to get. My whole point is that they were flexible and reoriented their doctrine according to the tools they had available and to the mission at hand. On the front of kit, we're in a very sad state in terms of the kit we have conforming to an overarching force employment concept for the Regular Force, I'm not even going to talk about the Reserve Force because at this point they exist to provide GIBs only. The Mixed TAPV/LAV 6.0 Recce Sqns are a prime example. Does the Army need seven recce squadrons? Put all the LAV 6.0s in one Squadron for each Regiment and pool the TAPVs in to Armoured Cavalry Squadrons. The TAPV would make a great vehicle for pursuit operations in low intensity conflict. I have heard through the grapevine that there is the possibility that the TAPV could be coming to Aldershot, Nova Scotia. I heard the plan is to bring up to 7 vehicles so that the Halifax Rifles would set up a training cadre. Imagine armoured reserve soldiers training on an armoured vehicle one hour away from Halifax. That could be a home run with regards to recruitment of reserve soldiers in Nova Scotia. Anybody else hear these plans? Imagine armoured reserve soldiers training on a new modern armoured vehicle one hour away from Halifax. As per normal, you'll send them away on summer tasking and you'll never see them again. The vehicle doesn't conform to doctrine anyways. My personal opinion is we bought a lemon because we didn't conceptualize what we wanted before we bought it. If doctrine was already written for g-wagon and rg-31, coyote, how is this different? Because our Armoured Recce doctrine is still based around sneak and peek, neither the LAV 6.0 or TAPV are designed to do that. The LAV 6.0 is an IFV that we bolted a surveillance suite to and the TAPV is an MRAP designed to traverse mined/boobytrapped roads and drive through ambushes. It's purpose is to get people from Point A to Point B unscathed. Mind you, I think our Armoured Doctrine is about 30 years out of date. We'd do better retooling our Armoured Regiments in to ACRs. The TAPV will make a great vehicle for pursuit operations in the Desert supporting heliborne infantry but it's not much of a recce vehicle. Is there any talk of integrating light vertical drones with the TAPV? It would seem that such integration along with the mast-based sensors would allow for greater standoff distances which would minimize the impact of the larger silhouette. Point taken; however, I would hardly take satisfaction in flood fighting as a gauge of whether it's effective in combat operations. It's an MRAP that we said is a Recce vehicle. I'd like to see us acquire Javelin. You can mount them on the Protector RWS system used by the TAPV. You can even mount hellfires on the Protector RWS. Combined with a UAV, even a micro one, it would prove a potent weapon system. This is kind of as segue into procurement, but structurally can the army not request "force enhancement" funding as part of an operations tasking and budget? Liberal government says: "You need to send a battlegroup to Latvia." Army replies: "Absolutely. But to perform the role you've asked we need to direct source the following items: (24) Javelin ATGM launchers with (98) missiles with associated training systems, (12) Sky Ranger Turrets to be refit to LAV 6 chassis, and (128) sets of Saab Barracuda Camouflage systems." Thus eliminating all the RFQ, regional benefits, bidding nonsense? A vertically launched, small UAV that can stay fairly low & quiet...acquire targets...and then be engaged with a ATGM of some sort, fired from the TAPV turret? Now that sounds like a good idea. Great for Recce with the UAV option, and able to take out more than just soft skinned vehicles & enemy personnel if SHTF. **I'm pleased to hear they are a lot more quiet than I would have thought. Hoe about small vertical uav plus Spike NLOS (as opposed to an ATGM requiring line of sight)? The Israelis have already mounted on vehicles much smaller than TAPV. Remius did not say that flood relief ops had been their entire experience with the vehicle to date. If "mobility and handling", ability to "get in and out of tight spots", and quietness were described favourably that would indicate that they've had at least a little chance to play with it in the field. Troops are more likely to complain about shortcomings than laud positive aspects, so any lack of complaints also indicates something. I await further user reviews, of course, but the only one seen so far is not that bad. Doctrine was not written for RG-31. We bought the vehicle to do a job for the mission in Afghanistan. Then for some reason the army staff college started teaching that it was the platform for the light company in an independent BG and for the light Bn in a CMBG … but doctrine was not written for it. Then somebody decided since we had it in Afghanistan we needed to institutionalize it with an enduring platform, and the distribution fit the staff college organization model … and still no doctrine was written. Then, the infantry corps persuaded the army that the TAPV was a bad doctrinally for the light infantry, but we had already committed to buying at this point, so it is coming. Mind you, I think our Armoured Doctrine is about 30 years out of date. The whole concept of "sneak and peak" is a non-starter against a technologically advanced adversary. I've watched similar conversations on here for over a decade and they generally seem to ignore the realities of enemy EW and ISR capabilities.